A no-frills how-to guide on moving abroad, based on my own personal experiences as a freelancer in her 20s, and the experiences of the expats I talked to in order to get more input for this post. I. First, my biggest piece of advice is not to overthink this. Deep breaths style. As odd as it may sound, moving abroad without a fixed contract is not immediately concrete or permanent; even though the beginnings of researching a move abroad can be extremely overwhelming and scary. What I mean is, don’t apply for a residency or an expensive work permit or anything just yet. Go visit a place for awhile first and see how you get along with the local community of expats. Spend enough time there that you don’t see it in a romanticized, holiday, touristic light, but instead how you would deal with being there working, commuting, paying for rent, making friends, and building a life that’s sustainable for you. Of course most of this is a big unknown that you won’t truly get a feel for until you’re living there, after you’ve started working and commuting and socializing and the honeymoon feelings have worn off. But I think a big mistake people make is thinking that visiting a place is going to be the same experience as living there. While you will definitely have beautiful times ahead with exploring your new home, having adventures with new friends, and indulging in new experiences (new restaurants, new cuisines, new languages, new activities! ), you will also be dealing with costs of living, commuting, a whole new work ethic that can be massively different from your own, inefficiencies, new cultural norms, maybe some corruption, confusing taxes, etc. For example, don’t think that just because you love safari that moving to an African country is going to be elephants and golden sunsets 24/7, all the time. It’s naive to think so. When I moved to a small town in Mozambique I really had no idea what to expect, and was unsure of if I’d love it or hate it. I had spent about a month total in this town before as a tourist — starting to wet my toes in the idea of what it would be like to live here — but spending an indefinite amount of time here (and especially working here) is a completely different experience. After I came here with a one-way ticket I spent about four months on a tourist visa, testing the waters and getting to know what it would take for me — a freelance photojournalist who depends entirely on airports to make a living and values things such as easy access to a nearby doctors office — before deciding to make the jump to get a residency/work visa. But all the while, I was constantly weighing how happy I was here, how I could make a living here, how I could support myself, how I liked the culture and the people I spend every day with, and if spending the money to get a residency would be worth it for this time in my life. This meant spending a lot of time talking with local expats and even local lawyers about my options and how I would exit if I ever did/do decide to leave Mozambique someday. But the point is, I spent months here before making the decision to stay, so don’t let the implied permanency of moving abroad scare you from taking a chance and dipping your toes in the expatriate waters. As long as you aren’t on a work contract that keeps you somewhere for many years (more on that later), and you’re willing to spend the money and time in getting to know a potential new home, you can, indeed, leave any time. (As could I). II. Another thing to consider is distance. If frequently going home to wherever you’re from is important to you, consider how much it costs to fly from your new home to your old home. For example, let’s say you’re from Chicago, and you’re between living in Beijing, China or Copacabana, Bolivia. Beijing to Chicago is a long-haul flight, but it is infinitely cheaper, and oftentimes certainly quicker (less buses, connections, and puddle-jumper flights), than Copacabana to Chicago. So it’s important to think about that and if that matters to you. It takes a long time for me to get from Tofo, Mozambique to Connecticut and New York, where my family currently is. It’s about two days (or more) of bus travel and air travel and long layovers and airport hotels. But is it worth it for me? I think so. (Although I do sometimes miss living 15 minutes from San Francisco International Airport, but we can’t have it all). III. The most important, and most obvious, thing to consider is money and work. What’s the cost of living like where you want to move? What’s rent typically like, and what kind of housing does that get you? How about public transportation, if that applies to you? Does the salary you typically make (or will make) allow you a decent, comfortable living? And, of course, work. Working remotely or freelancing is something a lot of expats pursue because it means not necessarily having to have obtain a working permit in your new country (this depends, though, on the country, so do your research), and it also gives you more freedom to move around and choose your new location based more on your personal preferences instead of necessity. Sounds idyllic, right! But that idealism then means that remote working jobs are remarkably competitive, and usually require a high level of training in a certain speciality (think: coding, web design, graphic design, SEO, remote engineering, copyediting, translating, etc). If you have the time, taking online courses (or even getting a degree) to specialize yourself in one of these coveted skills will make you more marketable for remote employers. Look at remote job listings and see what they require. This takes time, of course, but these things can’t be rushed. And if you’re going to make the jump to move abroad and have the freedom to work from your laptop, patience and determination is definitely key in making sure you can support yourself. This, however, is too much financial risk for some people, so there is always the option to pursue work in your specialty/field before setting out. Do some research into what’s available in the cities or locations you’d like to live, or alternatively, see what kind of global job listings there are for your career. This also has a major pro, in that you may get a sponsored work permit/visa which may make your life easier later. Also, of course, you have a guaranteed income. The con, however, is that you’re committing to a place you may not be sure you enjoy, and it’s usually for a long duration of time via contract, which makes leaving difficult if you find you want to go home or elsewhere. Though the plethora of options for working abroad may be daunting, it is exciting; you could open your own business, build a hip cabin and rent it out, sell pancakes out of a shack in a beach town in Thailand, sell handmade guitars or knit sustainable cotton hammocks or write a book or two. (Okay, maybe those don’t sound appealing, but you get what I mean). Just as long as you have the discipline to do the research and the savings to coast on while you get on your feet, you will, most likely, be okay. As with most things, just be smart and prepared and have an exit plan if things don’t work out how you want. V. With that all being said, when it comes to choosing a place (if you don’t already have somewhere specific in mind)… that’s really the exciting part. Start by making a list of countries you’d want to settle in, even for a short duration of time (you can live abroad for a year or less, remember, nothing has to be permanent). Reddit is a great resource for learning about countries and asking locals specific questions (there’s a SubReddit for just about every country in the world, so get on it and start researching and chatting with the people!). As well, there are tons of expat and digital nomad SubReddits and forums to read and ask questions on. “I Want Out” is another good one for people just looking for advice on the process of leaving. Think about some countries and then write up some questions that are important to you, and try to connect with locals and expats alike to get their input and perspective. Or, you can always just throw a dart at a map and go, which is fine for someone comfortable and able (monetarily) to do that. But I do think there’s something to be said about putting some decent thought into this, solely so you don’t end up spending your savings bouncing around places you don’t like and end up bypassing the place where you really belong. But, finally: be flexible and open to new ideas. I always thought I’d live in Tanzania when I'd someday move to Africa, and then suddenly it was going to be England, and then South Africa. But here I am in Mozambique, happy and fulfilled, but open to the idea that a year from now I could be in Botswana or Fiji or maybe tapping maple trees in hilly Vermont. Life is surprising. Experiment, and roll with it. Something I love about Mozambique is how Mozambicans love the water. There’s a stereotype that Africans hate the ocean, that they’re afraid of it. The purpose of a river or of the sea is to fish, to wash their clothes, to bend over with their backs facing up toward the glinting sun as they pick oysters off the rocks, to collect water to drink and boil and bathe in. But Mozambique is different. It was one of the first things I noticed when I first arrived here, and it’s one of the things that makes me fall in love with it all over again, like I am now. Mozambique and I had a fight recently. It felt like a lovers quarrel but much more cold and indifferent. I don’t really care to get into the details but I had one of those weeks where I dealt with it all: a string of robberies and home invasions in our sleepy town, harassment from drunks, carelessness. One of those weeks where even just burning my tongue on a plate of beans or getting looked at funny would almost send me into a fit of a tears. On one of these days I decided to get into bed at 2 p.m. and didn’t leave until the evening, in which I promptly walked into a fight where a man was hitting a woman and the police stood on the side, standing nonchalantly with their hands in their pockets. I turned around and went back home. Something aesthetic-travel blogs and filtered Instagram pages don’t prepare you for when you think about living in a third world country is that you are moving to a place where there really is very little justice. There just isn’t. It’s a place where the inner core is rotten with corruption and it spreads to the streets like mold, creeping into the lives of people who do not deserve it. The home robberies that have increased in frequency, where the crooks run free and, when they are caught and brought to the police station, they bribe their way out and flee. When men who reek of liquor hit their wives and girlfriends and the policemen stand on the side, making idle chitchat. Where innocent people just trying to get by come down with malaria; where people suffer from illnesses that would be so easily treated somewhere else. Moving to a country in Africa is not always elephants and palm trees. It’s corruption, it’s sexism on both sides, it’s knowing that if someone does cause you some level of harm, the most justice you will get is your friends running into the bush wielding baseball bats and coming back empty handed. And I think this has really settled on my shoulders and my mind this week: there is not always justice in an unjust world. But that doesn’t mean there isn’t, also, a lot of beauty. After a testing few days I knew I had to makeup with Mozambique after our fight, just like any relationship, I suppose. 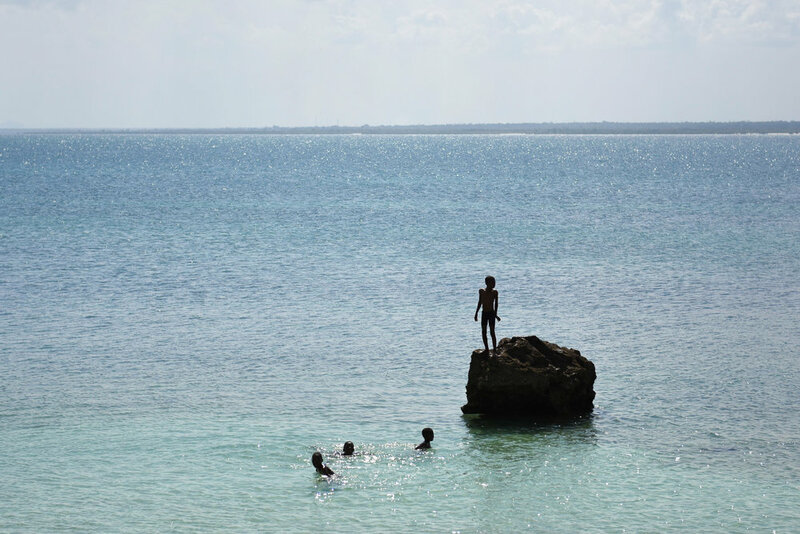 I went down to the ocean just before sunset and jumped into the water, turquoise and clear. I wrapped myself in my oversized towel and sat on the sand for awhile, and watched the exquisite world around me. Three Mozambican girls in their soaked school clothes were screaming with absolute joy, huge smiles on their faces, as they held hands and jumped into the waves. Holding their noses, smacking their hands on the water’s surface, running to the safety of the sand before leaping back into the waves. Behind me, a group of young local boys played soccer along the shoreline, and just down the beach I saw a couple of teenage Mozambicans jogging with their surfboards in tow. As they passed me, they smiled and waved, and that was all. One of the first things I ever fell in love with in Mozambique were the colors: everything is bathed in turquoise and gold and emerald green. Just as it was this afternoon. And the other thing, was how Mozambicans love the water. Just as they were this afternoon. Just as they are every afternoon, when I’m not too blinded to see it. There are a lot of beautiful things in this unjust world. I’m trying to figure out why Africa is so familiar. Not just familiar because I have, of course, been here before — but that kind of deep, down-to-your-bones kind of familiarity you get when you find a haphazard shoebox of childhood photos, or walk into a room that smells like that worn, red carpet from the living room floor of your childhood home. Every time I step off the plane in Africa, even the air is sweet and heavy and verdant and overwhelmingly nostalgic. The sensation feels so deeply embedded inside of me that it feels like I could find my way around the streets and the savannas with the same familiarity and ease of someone driving through the town where they grew up, decades after they left. It makes me homesick for something I can feel, that I’m sure exists, but can’t pinpoint its origin. Whatever it is, I know it smells like the air here. That was the first thing I noticed when I came to Africa for the first time, to Tanzania nine years ago. Stepping onto the tarmac around midnight, into the warm, still night: the air was just different. It was something I didn’t know air could be. It was some perfume of woodsmoke and wet acacia leaves and jet fuel and dust. If I could bottle it up and keep it forever, I would. Though maybe that would defeat the purpose of what makes the air here so affecting: you have to come here to have it. It’s the first mark — the first sign — that you’ve arrived somewhere very special. It’s the same way now. Stepping off the plane in Maputo was like stepping into every good memory I’ve ever had, all brought to the forefront of my mind. It makes every hard thing not only easier, but right. The chaos of the airport (where it takes two hours to get a visa and the power goes out twice and a lumbering, lazy, fat fly won’t stop trying to land on my cheek); the 3:30 a.m. bus journey up the spine of the country (with one stranger’s screaming baby on your lap, a chicken and a bag of grain by your feet, so many near head-on collisions that you lose count, and some cracking, muffled Nigerian tune blaring on loop for eight hours over the speakers). Being faced with a new life to adjust to (the privileges and familiarities and rituals of a comfortable life in the U.S. unceremoniously traded in for a whole new world and whole new life with a lot of unforeseen challenges to come). Anywhere else in the world these problems feel heavy, but here they feel welcome. It feels naive to fight against the current of a continent that doesn’t belong to me, that I am a guest on, because it’s a privilege to be able to choose it and to build a life for myself here. Africa is a practice of patience, but if you’re willing to be patient, the rewards are tremendous. On my first night in Tofo — the little seaside town I’ve chosen to call my base for awhile — I went to a little bar in the market, where I shook hands and accepted hugs from a wide breadth of expats, from all over the world who, much like me, decided at one point or another to make this place their home. Mostly though I was surprised by the number of “welcome back!”’s I received from people I had only briefly met in the previous year, when I first came here, having no idea that someday I would give it a shot as my home. The air smelled robust, of piri-piri and hot embers, of bug spray and sweat, of saltwater rolling off the Indian Ocean in heavy, humid clouds. Somehow, familiar. 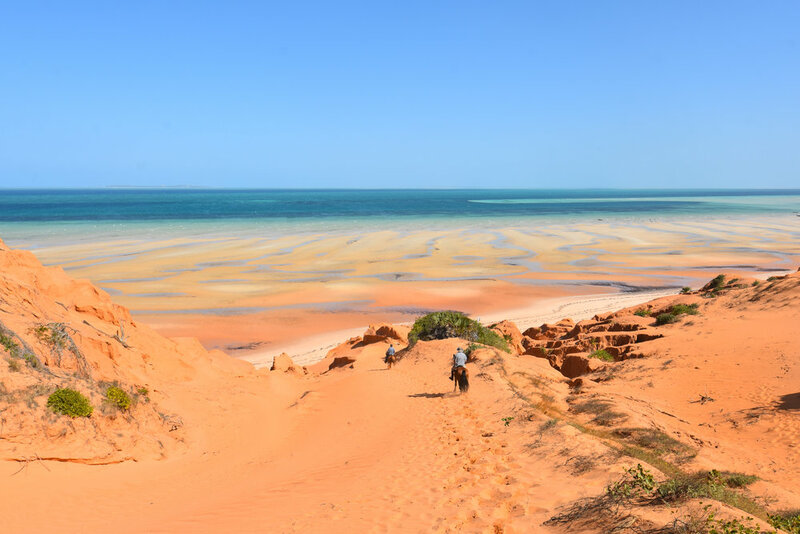 Seasons change in Mozambique, but if you just look at it, with its year-round emerald green palm trees and tangled patches of flowers, you can’t really tell. In the last few weeks I spent in Mozambique before flying back to America for the holiday, I found myself sitting in the garden under my dripping wet laundry hung on the clothesline, ants occasionally crawling on my knees and acacia thorns occasionally pricking my bare feet, just to escape the heat. I’d sit there with my laptop, trying to work with the glinting sun on the screen, picking at cold grapes on a paper towel I’d taken out of the freezer. It was the only midday relief I could find now that summer was, and is, settling like a heavy, wool blanket over that little corner of Africa. It’s summer again in Mozambique, unbearably hot and still, with evenings laden with sweating glass bottles of beer, humming fans, sundresses and hair sticking to our foreheads. Then there’s winter, which are months of reprieve; comfortably warm days and evenings chilly enough to need a sweater, or even a jacket — these are the months of sleeping under duvets, of warm sweet potato soup; things that feel like little daily miracles in a tropical country. There are the other seasons: the windy season, when easterly winds blow heavily from Madagascar, carrying clouds of jellyfish toward our shores and making the once-a-day flight out of town feel like a rollercoaster ride; there’s the humpback season, when the horizon is so saturated with migrating whales that, at any given moment, a quick glance out at sea will let you spot at least a dozen whales as they breach, slap their tails, chase dolphins and curious frigatebirds. During this season, you can hear them singing like sirens when you dive underwater; they lull beside you at sunrise as you sit on your surfboard, patiently watching them as they pass. You can take your kayak and paddle only ten minutes out from shore before you’re within just a few meters of one of these spectacularly (and frighteningly, I admit) gentle giants. But for me, nothing has marked the passing of time, and marks the beginning of summer, quite as much as mangos. With their blood red skin, plump and sticky, piled high by the dozens in overflowing baskets dotted alongside the highway that runs like a spindly vein up the length of the country. The mangos are back, which means summer is here. Which means the year is ending, and as I had my first mango of the summer a few weeks ago, standing wrapped in a towel in the kitchen, I realized that it tasted like January. It tasted like a year come full circle, a year about to end, and another year on this continent soon about to begin. Yes, there’s still another couple weeks until 2018 comes to a close. But for me, the taste of an East African mango was the beginning of me, I guess, accepting that soon, the year will be over. It has come full circle, back to me standing in that familiar kitchen, with the sheen of mango juice on my hands and its fibers in my teeth. You know how certain smells and certain tastes can be associated with memories so strongly that it almost knocks the wind out of you? Without me even realizing or noticing it at the time, that’s what a mango has become for me. The last time I had a mango was maybe the middle of February – right in the height of a sticky Mozambican summer, in a sun-flooded cabin that overlooks turquoise water, right at the very beginning of my insane (terrifying? exciting? wild? best-thing-ever?) move to Africa. I was dipping my toe into a life here. The year turned out to be incredible, though at the time I didn’t see it coming. Unbeknownst to me, I was about to be sent on assignments to the Seychelles, to Kenya, to South Africa, to Gabon, all across Mozambique. I was at the beginning of so much unforeseen: music festivals in Swaziland; countless road trips through Mozambique and South Africa; my work published in over 350 publications across the world; chasing northern lights across Iceland, listening to the volcanos rumble and the glaciers creak; countless mornings of fireside coffee and sleeping on jungle floors; honing my patience with snakes and scorpions and some awful thing called camel spiders; so many border runs it made my head spin; ringing in my birthday with the staff of The New York Times as we rain into the Indian Ocean at midnight; and becoming an official, legal resident of Mozambique. All of that, between then and now. Between the mangos of February and the mangos today. I know Mozambique doesn’t have the changing leaves in autumn or the exciting first snowfall that a part of me does miss. But we have our baskets of mangoes on the kitchen counter, blending one moment into another. I recognize, and apologize for, my pretty much complete absence from this blog for the past however-many months. Every time I would go to write, I found that I really couldn't get myself to make a post about life lately without talking about the big changes I've been trying to make. These changes often felt too premature to announce as so much was still in the works and unfolding, so I figured it was better to stay quiet while I tried to figure out this new phase in my life as new opportunities kept arising, the road kept changing, and new ideas kept emerging. I didn't want to speak anything into existence until I was certain. On Tuesday, January 9th, I'm moving to Africa to work full-time as a photojournalist throughout the East and Southern region of the continent. It still feels pretty surreal to say. This move is big and challenging and wild and exciting but with my one-way ticket just days away, it couldn't be any more real. It also couldn't be any more right. Since my first time to Tanzania in 2010, which was also my first longterm trip outside of the U.S., I felt on some level that I would someday live and work in East Africa; I just didn't know how or when or for how long or if it would have anything to do with the field I work in. However, in the early months of last year, I began planting the seeds to figure out how to make the move happen. I knew I'd have the ability to leave San Francisco come December 2017, so in the interim, I searched to see what was out there. I followed every single lead I could find, I bothered every single editor I could somehow find the contact info for, and my search even took me to London in March to see what I could find there. However, after an amazing opportunity presented itself, I ended up traveling to South Africa, Botswana, and Mozambique from May to August to work for three magazines, which was the final incentive I needed to cement the decision that I had to move there, indefinitely. I had to give it a go. I was enamored by how fulfilling my work was, how exceptionally beautiful the region was, and how wonderful the people I had met were. And with offers to come back to work for these magazines again in 2018, as well as landing work for two other publications that have been my dream jobs since I was 15-years-old, there was no further question. This was it. This is it. So I went back to San Francisco for the last time, and started packing. Fully appreciating the fact that I was leaving California on good terms with the city that had given me so much trouble during my first few years. Saying goodbye to friends with a meek "see you soon..? ", even though you both know that's really, honestly, probably not true. A suitcase and a backpack what will go with me to my new home on my new continent. I left my keys on the empty counter in the kitchen, and my life in California came to close. Me, Alamere Falls, Point Reyes. 2017. Photo by Andy Taylor. I won't pretend that this move is going to be easy. It's going to be hard work, it's going to be challenging. It's going to be faraway from my family and beyond July of this year, it's relatively unforeseen. But to say that I'm just looking forward to the challenge is a monumental understatement of how immensely excited I am to begin this adventure. Every year that I've traveled and worked in this part of the world has only further cemented how right it feels to be there. So here it goes. Open for anything. Ready for everything. Absolutely not looking back. Tofo, Mozambique - the first place I'll unpack my bags. Somehow a Snickers bar is most satisfying when it’s been accidentally frozen long enough to chip a tooth when it’s finally bitten into after being chiseled with a broken blade in a log hut during a blizzard. I’d been carrying that particular candy bar at the bottom of my backpack for twenty-seven days. When I finally pulled it from the trenches of my 85-liter pack (which was essentially the equivalent of carrying a small caravan on my back), it was dented, poked, and prodded from the weight of ice axes, misshapen shoes, safety ropes, tent poles, half-filled water bottles, rocks I found on the path that seemed interesting enough to keep, and bags of clothes still damp and heavy from being haphazardly washed in the Kali Gandaki river. When I had first tucked that chocolate bar away into the depths of the backpack, I was standing in my warm hostel room in Kathmandu in my freshly-washed jeans and boots that had yet to be introduced to mud or ice or quicksand, and was giddy with the idea of myself peeling off the Snicker’s tantalizing wrapper once I reached the hardest point of the 35-day trek in the Himalayas that I was about to attempt. Most trekkers in Nepal tend to stick to three main routes: the twelve-day walk to Everest Base Camp, the fifteen-day walk to Annapurna Base Camp, or the twenty-day walk through the entire Annapurna region called the Annapurna Circuit. I found, though, that because of the frequency of small villages throughout the Himalayas where it’s possible to gather food supplies and gas — which is essentially all you need to keep going in the backcountry — I could stay out in the mountains for as long as I wanted, just as long as I could have access to a refueling village when I was running low on supplies. So I decided to link together the climb to Annapurna’s Base Camp (which peaked at the base camp at 13,600 feet) along with the entire Annapurna Circuit (which peaked at the top of a pass called Thorung La at 17,700 feet), which seemed like an exciting and challenging trek. Except, that left me with the pressing issue of which trail summit was monumental enough to have my Snickers. On my comfortable flight from New York to Kathmandu, and then on the eleven hour bus ride to the city of Pokhara with a chicken and a random child sitting on my lap, and then on the back of a motorcycle-taxi that took me to the trailhead nestled at the foothills of the Annapurna region of the Himalayas, I contemplated at which point in the coming six weeks I would fish out the chocolate. When I finally bit into the candy bar, however, I wasn’t watching the mauve alpenglow of sunrise illuminate the icy massifs and glaciers surrounding me at Annapurna’s Base Camp. I also wasn’t standing just shy of 18,000 feet at one of the highest walkable mountain passes in Nepal, in a flurry of whipping snow and blue sky and sun-bleached prayer flags fluttering so fast in the icy wind that they sound a cacophony of helicopters in the middle of mountain wilderness. Instead, it was in a cramped log hut with enough spacing between its panel walls that the snow from a blizzard outside consistently collected in the crooks of my arms if I stayed still long enough, and accompanied by the weak flames of a dying fire (we had to save kindling, who knew how long the storm would last), and two men who were too deep into a conversation about the existence of God to notice that I was busy attempting to thaw out the frozen caramel of my trekking reward on a lukewarm log. Don’t get me wrong, though. Up until that day, everything had gone without incident. In fact, each day in the mountains began to blend into the next, defined only by changes of scenery; one day follows the length of the river as it snakes through meadows of purple alpine wildflowers. Another day traverses suspension bridges missing boards where there certainly should be boards but are too tangled with prayer flags and fraying ropes to really give any trekker enough time to fully analyze the safety specs of these ancient contraptions. Another day climbs steeply through cloud forests, around narrow bends in the muddy path that sinks down into valleys and up again into the foggy cliffs, where both local children and mules and red-furred monkeys watch from canopies and flowering rhododendron bushes until, all at once, I’m alone again. There are small consistencies in these days, though, despite the changing terrains and watchful eyes from those who are passed. Going to sleep at sunset, waking just before sunrise. The rich woodsmoke and ginger scent of a cup of milky, sugary chai brewing at a teahouse as Iccrouch outside, attempting to dry out my boots in the last rays of sunlight from an accidental step in a stream. The countless times I almost tripped on a rock or a patch of ice because I was too busy focusing my eyes on the impossibly foreboding view of a peak looming on the horizon. You think mountains are big, you think clouds are high. But then you see the Himalayas. There’s also a certain amount of camaraderie on the trail — after all, because most trekkers do one of three main trails, there’s a good chance a backpacker will consistently run into another backpacker they’ve ran into before, so even the solo trekker, like myself, ends the day sharing a thermos of hot chocolate with someone they’ve seen before — but for a good deal of the time in the Himalayas, I was alone. In fact, I was so transfixed on the fact that I even made it to the summit of Thorung La Pass and Annapurna Base Camp that, when I did, I sat in silence, alone, and completely forgot about my Snickers bar. Usually it was only the loss of feeling in my fingers and toes, the shallowness of my breath, and the impending sinking sun behind the jagged horizon that reminded me to keep walking. I had completely forgotten about that precious chocolate bar until it was day thirty-one on the trail, and we had just hit the twenty-five hour mark of sitting in that hut by the fire when Klaus asked through his thick, guttural accent if we were sure that we didn’t have anymore food, and I remembered the candy bar. It was not the most ideal situation. As I used Klaus’s pocket knife to whittle the frozen chocolate into three pieces to split among us, I thought about myself on the flight descending into Kathmandu when I was deciding when I should eat the Snickers. It’s safe to say that at the time, I did not anticipate it happening like this. But I guess that’s what I deserved for thinking I could make it out of six weeks in the Himalayas unscathed. About three hours after I descended from Annapurna’s Base Camp, I found a group of Sherpas standing on the side of the trail talking into radios with worry fixed on their faces, which is never a good sign, especially not at 13,000 feet. Quickly they informed me that a low-altitude blizzard had swept into the valley beneath us — a valley that we needed to traverse as there was no other way to get back to a town or road — and took down an avalanche with it, covering the only route in and out of the section of mountain I was in. As they trudged through the snow past me to go check for other climbers up at the base camp to inform them, I asked what I should do. I continued down the path as the storm clouds grew heavier and the path became increasingly heavy with snow for a few minutes until I was met the familiar smell of woodsmoke, and then the sight of flickering orange light through a cracked door of a little hut down a hill. As I stepped inside, I was met with a few sights you don’t normally find a traditional log cabin. First, there was no actual floor — just a layer of straw dusted with the snow blowing in through the cracks of the walls — and two white men, about my father’s age and my grandfather’s age, crouched by the fire, sharing a plastic bag of trail mix. The grandfather-looking one seemed to be fishing out the M&M’s. Immediately I was welcomed to join them, and somewhere in between being offered a handful of the trail mix and a joke that went something like “Well, who knew it could snow in the Himalayas!”, I attempted to put together some pieces about the people I was suddenly sitting between in a small Nepalese hut. The younger of the two introduced himself as Klaus, an Austrian mountaineer who was visiting Annapurna’s Base Camp for the seventh time that season to acclimatize himself before attempting a summit push later that year. He wore a red bandana tightly around his neck in lieu of a scarf, which didn’t quite draw attention away from the olderman whose jacket and backpack were sewn with so many rainbow peace & love patches that I felt like I was looking at a picture my dad had once shown me of himself in the 70’s. He introduced himself as John, who was 75 years old and hailed from Seattle, and had been going to Nepal every year for the past thirty years of his life. Then, without asking anything about who I was aside from my name (which they both never got right but after three attempts to correct them I just accepted my fate as “Kate” and “Tay”), they continued their conversation where it was before I appeared. I settled in. For fifty hours, it continued. Though the snow outside steadied, it never seemed to slow. And neither did John and Klaus’s debates. As if I was just a fly on the wall, I sat cross-legged on the frozen straw floor, listening to the two of them discuss their purposes in Nepal, whether God exists, whether they had randomly ended up here or if there was a greater energy who put them there, or if they themselves had subconsciously willed this into existence. I was mostly concerned that I was running out of things in the room to count to entertain myself (seven peanuts in my section of the Snickers bar, for example). A few times, it seemed that the snow had slowed enough for us to descend and make a new path around where the avalanche had wiped out the trail, but ultimately it was too risky. So we waited. And waited. I walked a few laps around the cabin, but would come back in to find more bickering around the inevitability of the dire fate of the human race. During this particular debate, I counted thirty-three log panels on the roof of the hut, and nine chocolate chips in the last Cliff Bar we each had. Half of the bar was lunch, the other half was dinner. I was asleep by 4:00 both nights. On the third morning, all it took was a peak through the panels of the wall to see the green light of the backcountry: blue sky. As I began walking down the trail, using my trekking poles to steady myself on the black ice underneath the fresh powder, I thought that maybe once I’d get back to Kathmandu, I deserved one more chocolate bar. But I was really sick of Snickers. Looking back toward where the blizzard hit after traversing out of the mountains. The avalanche is the solid patch of snow you see on the face of the half-hidden mountain on the far left. Five continents, fifteen countries, tens of thousands of miles. I remember the drive to San Francisco’s airport on that morning, it was cold and dark for spring, everything covered in dew and the tops of the eucalyptus trees shrouded in a heavy layer of fog. I remember I could smell the ocean that morning. I remember I walked through my house, lightly running my fingers over every wall I walked past as I headed for the front door, as I always do before departing for a trip (I don’t know why I do it, actually, it started as something I was unaware of but I feel like it’s my way of saying see you eventually to the sturdy walls that are home, sturdy walls I will soon be without), but I remember thinking, this time is different. This time is different. I wasn’t just leaving for a short work trip and would be back in a couple weeks, or to visit my family in the east coast and would be back in a few days. I wasn’t even leaving for one of the longer, 6-8 week expeditions I’d found myself doing in the past few years, where I was always focusing on just one country or region and was always, always, traveling with somebody; whether a boyfriend, a friend, clients, colleagues. I felt, this is different. There was a plane at the airport with a seat waiting for me — the first leg of 42 flights — that would take me to 15 countries over the course of almost five months, on a nonstop expedition to five continents. The last time I did a round-the-world like that — back in 2013 — I came back to America feeling transformed, mesmerized by the euphoria of solo travel (I’d traveled solo countless times before, but never for 9 months, to 12 countries, nonstop), and mostly, just how different my life was. I was happier than I ever thought was possible. I met people that mattered more to me and felt more familiar than others I’d known my whole life. My career took off. I discovered a life full of joy, of adventure, and forward to me standing in the empty foyer of my house, it was about to happen again. As I locked the front door for the last time for months, I wondered how different my life would be the next time I’d put my key in that lock. I wondered if I would be sicker, stronger, happier, tired from so much transit, or eager to leave again; who I’d meet, who I’d reconnect with, what would move me, what would challenge me, what would change me. Before pulling up at the Departures terminal that morning, through the heavy San Francisco fog, the clouds cleared for a moment and I saw the sun break through the mist, casting long amber rays onto the tarmac, pulling my eyes up to the sky, as if the world was saying, Come closer. You have no idea what you’re about to discover. But now it’s over, and I’m amazed. I knew that I would enjoy my adventure — even on past trips abroad that have lasted for months (not necessarily RTW’s, but longterm expeditions) where I was deeply challenged or frustrated or sick or exhausted, I always walked away with something, so it was never any doubt that I wouldn’t grow from this RTW, in one way or another. But the scale in which I was shown the true, deep, bountiful beauty of the planet and so many of its creatures and people — kind, honest, beautiful, extraordinary souls — is something that kept leaving me speechless. Again and again and again. I remember, towards the end of my first two weeks in South America, I was swimming in a hot spring deep in the Andes mountains at 15,000 ft. It was 1 o’clock in the morning and just 2°F, and I floated with my neck craned up towards the heavens, watching meteors and shooting stars streak across the gloriously black sky, covered in a blanket of stars and a Milky Way so remarkably bright that looming glaciers of the surrounding Andean peaks were reflected the celestial light, making the mountains illuminate against the navy darkness, as if cradling me in a valley of sleeping, glowing giants. I remember thinking, This is happiness, and I don’t know how it can get any better than this. Somehow, though, it always did. It always got better. As I scaled the continents, drew closer, discovered, I pushed myself beyond my limits, and I felt. I felt. The numbness of stagnancy was shaken off me that moment my plane first lifted off from San Francisco those months ago, and every moment since then has felt like God or the Universe or whomever or whatever was grabbing me by the arm, leading me to someone or something incredible and saying, This is here for you, this is how the world can be, it’s always here for you, you just have to choose it. Then I arrived here. Collapsing in my final Departures terminal with deep, bone-aching exhaustion — but, the kind of good exhaustion, like the kind you have at the end of a long ten mile hike where your body is beautifully sore and you’re covered in dust and mud and are smiling wildly and sleepily and euphorically at passerby’s who probably think you’re crazy — exhaustion that sweeps over you and just as it makes you feel eccentrically happy and dizzy with love for everyone you’ve met and everything you’ve seen, you also notice a slight, sad twinge behind it all, and you notice an underlying sensation of melancholy and nostalgia creep into your chest, waiting to be acknowledged and carried and slowly grow heavier as you transition back home. When a few days pass and you begin to miss the simplicity of living out of a backpack, of only having to carry what’s necessary (and therefore realizing everything you own that’s not), of certain peoples’ voices and nights of ringing laughter (laughter that’s so deep and loud and makes your stomach cramp, laughter that makes you realize you haven’t laughed like that in, what, months? years? ), of vistas that move you to tears and days so heartbreakingly beautiful that they bring you to your knees, and the moment when you unlock your front door again and step inside and think to yourself that everything is the same, except you, and you put down your backpack and find something, somehow, different. I know I will remember this adventure as one of the most poignant, most remarkably special experiences of my life. It was a reminder of happiness. It was a reminder of everything I’d lost, come back to me. It was a reminder of who I am. It was happiness. From the lion calls of Botswana, from the outstretched arms under cascading waterfalls, from the rooftop sunsets and ramadan of Morocco, from the deep jungles of Sumatra, from the glaciers of Peru, from the ramba and rum of Cuba, from the midnight swims under fireworks and stars of Indonesia, it was everything. It was indigo. It was brightness. Go bravely into the world. Let your life unfold. Let the world show you how big, how surprising, how magnificent it can be, and you will discover. I know I have. Let's see where this goes next. Rooftop bars where white-bearded expats sit in woven hats amongst young Brits in polos, smoking their long cigarettes and drinking mojitos out of tall, sweating glasses. An acoustic guitar is strummed by a man in a white linen shirt, and a cool breeze breaks the heat as it rolls in from over the ocean. I take a sip of an espresso in between heavy conversation about the revolution, and I can’t help but wonder if I’ve stepped into an alternate reality, or at least one where I can’t help but understand why people come to Cuba and never seem to let it go. Cuba is everything you would ever imagine, it’s a postcard come to life, a humid History Channel special that you walk into, and yet it’s enormously beyond what you could have ever expected. Havana itself surprisingly quiet in terms of traffic, curled up on the empty, polite shore of the Caribbean and the tumbling green forests that line its fortress walls. Cuba's crumbling streets dotted with wonderfully colorful cars from the 60’s – yes, there are as many as you’ve been lead to believe – their whimsical horns and roaring exhaust pipes creating a nonstop cacophony against a backdrop of blocky Soviet buildings, British colonial mansions covered in ivy and graffiti, and turquoise-and-gold painted restaurants and storefronts where locals lounge outside, reading old novels and selling cigars and pineapples and offering to shine your shoes. The accents are as thick and sweet as the cigar smoke in Hemingway’s favorite dim bars, and the locals openly grab each other’s hips in broad daylight on the stone walls that lines the marinas, or next to the square’s fountains, their skin bathed in buttery evening light. 3 PM on a Monday feels like 2 AM on a Saturday, and it’s effortlessly eccentric, almost maddeningly racy, and each minute spent in a crooked, dusty, deliciously musical alleyway almost begs you to join everyone else, to wear a little less. It feels like one hundred different places I’ve been to all rolled into one: the isolation of Barrow, Alaska; the colors and cobblestone of Cusco and Quito; the whimsy of Dubrovnik; the dust and Soviet squares of Bosnia; the sensuality and intimacy of Mykonos. Police officers stand on street corners playing guitars, apartment balconies overflow with purple flowers yet stand above crumbling imperialist Danish buildings, each distant note of salsa music and the smell of rum begs you to come closer. It’s dystopian, it’s deep, it’s everything you thought couldn’t exist rolled into one little gorgeously mysterious island. The rest of the country as well is vivid and bright, with richly green mountains that hold deep valleys of red rock and cool waterfalls, and empty, sprawling coastline that boasts vibrant coral reefs swarming with passive, curious sharks, hundreds of neon fish, and emerald waves that gently lap the white shores. Cuba is pausing to chew on sugar cane offered by an old farmer you pass by, it's the sound of a Harley's engine rippling across plains of buffalo and wildflowers. In five days of insanity, you traveled to the mountainous interior of Java, Indonesia. You summited three active volcanos, scaled a thousand meters, twice, into two bubbling calderas, woke up at midnight for each summit push (and therefore are running collectively on 9 hours of sleep for those five days), got caught in rainstorms and lost your vision in a sulfur storm, haven’t eaten anything besides questionable coconut biscuits and roasted corn from some locals at small villages, developed a terrible sore throat from a toxic gas cloud, saw a tornado of blue fire that made you question whether you were dreaming or hallucinating (but no, it really happened), felt an eruption rumble at your feet, and are now cramped in a smoky bus, 12 hours into what was supposed to be a 5 hour journey to the coast to get in one last minute of surfing before flying to the jungles of northern Sumatra to search for the last remaining wild orangutans. You're hungry. You're exhausted. You smell intensely of sulfur and cigarette smoke. Tell me, what could be lovelier? The transition from the tourist-packed islands of Bali, Lombok, and the Gilis to Java was stark; even though the transition merely consisted of a ferry ride across a small channel, getting off in Java felt like entering a new country, where the Call to Prayer bellowed from every direction and Westerners seemed to vanish, leaving me sitting solo and cross-legged on a sidewalk, having photos taken of me by curious, passing locals. For the first time during my entire time in Indonesia thus far, I felt completely alone. I went to Java specifically to climb three remote volcanos in the interior, and though they're relatively popular climbs, I was still surprised by just how alone I was. In Bali, I was constantly bumping shoulders with Western tourists, but in Java, I only ever saw those crowds on the mountains themselves, and even then it was surprisingly sparse. Besides that, I was often the only non-Indonesian on buses, on trains, even at guesthouses. It finally felt like less like a vacation, more like an adventure, and I was finally off the map. However, it didn't take long for me to realize that this part of my journey was going to be difficult. During my time in Java and Sumatra, I physically pushed myself beyond what I'd anticipated ever doing in Indonesia. It was not necessarily my intention to be so aggressive in terms of climbing, hiking, trekking, camping, but I was there, and after dealing with the difficulties of reaching Indonesia in the first place, I wasn't intending on letting a single opportunity slip by; the mental images of volcano summit views were the original reason why I decided on Indonesia months ago anyway. So despite my better judgment and my glaring desire for a good night's sleep, I traversed the mountains of Java, sleeping a couple hours here and there in dank guesthouses in the misty highlands, rising at midnight to summit peaks and gaze downwards from caldera rims, then losing track of time while sitting on the next humid, crowded bus as it rocked towards the next village, the next peak, the next highland. The climbs were significantly more challenging than I expected as well, with steep, slippery slogs that consistently reached 60 degree inclines for miles, upwards of nine hours of scrambling up-and-down rock faces or snaking up trails of volcanic sand and scree (one step up, two steps back). The benefit of spending so much time on the volcanoes, though, was the incredible relief from the excruciating heat of sea level — it was even chilly enough on the peaks where I needed my down jacket, which I hadn't worn since the Peruvian Andes months ago — but there was still the humidity, thick and damp, which left me perpetually feeling like I was covered in wet mud that wouldn't dry, with clothes and gear moist and pungent with sulfur and dust. As well, most of the climbs were in the rain — torrential downpour-type rain — where I resigned to the weather, accepted it, and climbed anyway. Most summits were so shrouded with fog and heavy storm clouds that the spectacular vistas I'd originally come to Indonesia for were null; 14 hours of climbing to reach a view I'd dreamed about for years, just to be greeted by a somber screen of gray. But even though I may not have gotten my spectacular, picturesque volcano sunrises, I got to experience the mountains in ways that few others do. Because of the horrible weather of the week that I was there, apparently many travelers avoided the mountains, which seemed to explain my apparent isolation. Even though I was consistently caught in rainstorms and didn't see the views that I came to Indonesia for, I was fortunate to feel almost alone, to spend time solo in the mountains, and to experience their remoteness as I originally dreamed. And when there were moments of awe-inspiring beauty — such as the blue fires of Volcano Ijen, or the tumbling plumes of ash and smoke from Volcano Bromo, or the vibration through my whole body as the volcano roared and rumbled beneath my feet — it felt like Java was opening itself up, even just a little bit, for me. And yet, after I left the mountains and ended up in the Javanese city of Yogyakarta, exhausted and sore in ways I didn't think was possible, I felt, for the first time during my entire round-the-world, burnt out. The pollution, crowds, heat, dust, and overwhelmingly noisy streets of Yogyakarta were difficult to stomach after having spent so much time in the remote, picturesque seaside villages of Lombok and the clean mountains of Java. Yet as my plane from Yogyakarta descended into the island of Sumatra, I was instantly enamored again with the possibilities of Indonesia. From the Sumatran city of Medan I immediately jumped in a bus to go to the interior, to a rainforest where the last remaining wild Sumatran orangutans hide. From the minute I stepped into the village where I'd be based, I was greeted by the beauty I'd been missing while in Java: gloriously green forests and sparkling rice terraces, a tumbling river that lapped up on the front steps of my porch where I swung in a hammock all evening listening to a thunderstorm, total quiet (no roads and no traffic for miles) with the exception of monkeys playing with coconuts in the trees above my roof, and a smattering of travelers who'd come to be the lively group I'd trek into the jungle with in search of orangutans. So we trekked for days, for hours, only stopping to camp on the shore of the river (which was just a tarp propped up on bamboo poles with some flimsy mats for us to lay on), then woke to keep walking, hiking up steep muddy cliffs for hours at a time then down through treacherous, slippery ravines, pausing to cut open a watermelon in a clearing of ferns or to jump into the river when we had a free moment and there were no signs of rhino or tiger around. Sumatra was about eating curries and sharing stories around candlelight during the thunderstorms, laughing as we attempt to sleep while trying to keep monitor lizards from taking our boots. And, of course, the moment of unexplainable joy, of sweeping awe-inspiration, the first moment we spotted the movement of red fur of our endangered cousin sitting high in the branches, curiously and passively watching us. The bus ride from the jungle back to the coast was long and unbelievably hot, and after having rushed and unsatisfying goodbyes in the middle of the humid, crowded chaos of Medan’s bus station, one moment passed and these people I had spent every hour with for the past however-many-days were gone and I was, for the final time, alone. The question breaks my heart, but more than anything, makes me feel extraordinarily lucky. It has been years since I've been anywhere that has shown me as much beauty, adventure, and incredible people as Indonesia has. The miss and nostalgia I have for every soul I came across, the deep connections made, the midnight swims in the sea, the rice terraces and tangled jungles, the profound sense of possibility, is something I haven't experienced to this degree and magnitude in such a condensed amount of time in... well, I sincerely can't remember. And while I'm extraordinarily grateful for everyone I've met and the things I experienced in Indonesia, it's mostly put a fire in me to keep pursuing this life, to keep finding these people, to keep drawing closer. I promise I will. I guess you had to die eventually. I just never thought it would happen while I’m routinely untangling you from the ropes on top of my 4X4 in Marrakesh, when something amiss catches my eye, and I notice the beginnings of an unraveling hole at your base, and it slowly dawns on me. You have carried me across the world. No friend, no piece of equipment, no sweater or shoe or hairbrush of mine has seen as much as you have. You first became mine in 2011, when I decided I would be crazy enough to backpack and mountaineer my way through the Andes, and I over-ambitiously hoisted a brand-spanking-new 85-liter bag onto my back. Our first introduction to each other was during those months, and not once did you never let me down. Or let my stuff down. Which is important, too. My old friend, you saw 35 countries; over half of the amount I’ve been to in my whole life. You saw over 800 miles of deep backcountry, from the tundra of the Arctic to the glaciers of Kilimanjaro. You saw -30 degrees (on multiple occasion), you saw deep, endless jungles (countless times), you’ve been scratched at by bird talons and ice axes and shattered glass and exploded shampoos, and you always survived. You rode on trains through Europe, buses through the Himalayas, were accompanied by chickens, by donkeys, by thousands of suitcases and strollers and packs in the bellies of countless planes. You always showed up, too. Even during delays, through canceled flights, or nine connections, you were always on the other end, waiting patiently at baggage claim. And as the years passed, you became a little less water proof (dropped in Icelandic hot springs or Bolivian rapids too many times), a little more stained (a little orange mud from Uganda here, a little red and purple dye from the Nepal Holi Festival there), a little more frayed (getting caught on train doors and trampled on by passing oxen), and a little more questionably darker (tar from an airplane tarmac maybe? I’m still not sure), but you were tough. You pulled through. You met more boyfriends than my family has, you were a pillow on hard terminal floors, you were a constant, a home, for the past five years of my life. You traveled the world with me. Some people have security blankets or a necklace or a sweater tinted with nostalgia. I have an old, tired, dusty backpack. Now you will live out your days in Namibia. Maybe you will be repurposed. Maybe a cat will live inside of you. Maybe you will end up in the Windhoek dump. Or maybe you will stay hidden in the storage closet of my hostel until someone discovers you three years from now, and only then will you be reborn. I don’t know your fate, but I just wanted to say thank you. Thank you for being a home. You will be missed. (And, weirdly enough, I really mean that). I was supposed to go to Indonesia four days ago. not indefinitely, though. there were issues I had to deal with in zambia, so it was actually a good excuse to push back my flight to Indonesia for two days to focus on what needed to be dealt with in zambia, and all the while debating whether or not I truly wanted to go to indonesia. I tried not to let emotions play into it; I was already overtly depressed about leaving africa, and tried to think logically instead of emotionally (such as: do I really not want to go to Indonesia for fear of my safety, or is it just that I’d rather stay in cozy, safe, familiar southern Africa?). in the end, I decided to wing it, and I departed livingstone for johannesburg to catch my fight to Doha, then to Jakarta, then to a remote island where I was planning to climb a mountain in only a couple days’ time. I came to terms with leaving Africa; processed it justly, wrote about it, and felt comfort in the conviction and knowledge that I’d be back next year for several months. this and now was my time for Indonesia. so during my little layover in johannesburg I relaxed, let loose, had two beers with new friends, and walked proudly and capably to the check-in counter to get on my flight, when I found out – long story short – that my tickets were void due to government issues, and there’d be no way I’d get to my flight, and my initial amused/disbelief laugher turned into embarrassing sobs as the reality really hit – I’m not going to Indonesia, I have nowhere to go in Johannesburg, it’s almost midnight, I’m not going to climb the mountain I’d had my heart set on for months, I was finally ready to depart when this happens, what could it possibly mean – but behind all these thoughts there was a part of myself that felt, more than anything, relief. that night, I ended up at one of Joburg’s best hotels as an early christmas present to myself, where the staff pityingly brought me dinner at 1AM and I tried to facetime and text people but was so tired I was tripping over my words, and sincerely did not care. what mattered was that I was still in south africa, and I kept turning over every moment of the past 3 days in my hands, desperately searching for the reason of why this was happening, why now, and mostly, why never before. all day today – specifically for the past 13 hours – I’ve been sitting on my fluffy king size bed while researching what to do. road trips through mozambique; three weeks in japan; australia then new zealand; cameroon, maybe even algeria. with every new idea that seemed foolproof – yes! this is it! – i realized about 20 minutes knee-deep into google searches that i simply didn’t know enough. i’d have to make a decision by tomorrow morning, and i didn’t know anything about japan, or cameroon, or new zealand. i’d need weeks, at least, to have any idea of what to do, where to go, what made sense. what i kept coming back to, though, was what i knew. I knew Indonesia. so it made sense: go to Indonesia. or… go home. right now, those options seem best. yes, I could road trip around mozambique and lesotho and swaziland, but I’ll be back in southern africa next year, and I can do that then when I have time to do it correctly. yes, I could go to japan or fiji or some random place I didn’t think about until a few hours ago, but would my time there be any safer than going to Indonesia? would it be as fulfilling if I went blindly, whereas with Indonesia where I’ve read & poured over every inch of that country for the past six months? every alternative I came up with seemed to point back to the simple truth: I’d decided to go to Indonesia, and the only real other option would be to go home to New York. depending on the minute, the moment, going to New York sounds like heaven. the thing is, for the past weeks that I’ve been in southern Africa, I’ve been completely enveloped in pure, unadulterated bliss: perfect weather, stunning landscapes, incredible people, and a place that feels more like home to me than anywhere else in the world. even now, as I sit here typing this, it’s a comfortable 60 degrees, I’m freshly showered and my clothes are washed, I’m drinking a wonderful pinot that reminds me of the great wines I have in New York, the wifi is the fastest it’s been in months, and I’m comfortable, happy, and safe. going home to new york would the continuation of that: comfort, and perceived safety. going to indonesia would be the beginning of 5 weeks of absolute chaos, heat, long bus rides, unknown people, unknown places, confusing logistics, massive remote mountains i feel inclined to summit, humidity, travelers sickness from bad water and unclean foods, and mostly, a deep, perceived fear of the state of the world. I could go to new york tomorrow instead of indonesia, and I could be killed by a drunk driver or a moose on a country road. people keep telling me to be “aware” and “afraid” of Indonesia and the radicalization and threats – they constantly question the audacity I have to be traveling there during such a time of turmoil around the world – but no one tells me to afraid of night clubs in florida, or of train stations in belgium. the other day my father angrily texted me saying “where are you going after Indonesia? Baghdad? Syria?” and I wanted to text him back asking him to use the same logic; when he was planning to forego all his business in Florida, or in Paris? what I’m trying to say to you all, is that fear is a very real and very credible thing. we live in a media-centric society where we are constantly bombarded with headlines that terrify us. I have probably received close to 300 messages in the past year alone from readers telling me that they’re afraid to travel because of this big, bad world, and while I’ve always told you all that for every evil person there are a million kind ones – and I stick with this statement – I want you all to know that fear hits me sometimes, too. and as I’m at this crossroad, it’s hitting me sincerely and deeply now more than ever. but the world is good, and kind, and it’s waiting for us. if we choose to be bystanders, to live in the perceived safety of home, we will miss out on a glorious world that’s just waiting to be discovered. there are life-changing people I’m on the trajectory to meet, phenomenally beautiful places I’m waiting to see, significant memories that are waiting to be made, and I can’t wait to discover them, if only I’m brave. and in all the years I’ve been doing this, I’ve always known that the greatest moments, people, and places come to me when I’m out there, on the road, letting the world unfold before me. it’s an extraordinary world, a massive world, and we cannot let fear hold us back. I hope you will all find your Indonesia’s. And I hope you will go there, too. This is the kind of passionate conviction that sparks romances, wins battles, and drives people to pursue dreams others wouldn’t dare. When I was a teenager, I was hiking down a rocky trail on a small mountain in northern Tanzania when I tripped and landed straight on a tangle of acacia branches (from the kind of tree that I lovingly call “the Lion King tree”; those crooked, beautiful ones with the branches covered in ivory-colored thorns that you see in every African postcard or film). When I fell, my hand landed straight on top of the tangle of the thorns, and the tip of one pricked the palm of my right hand at such an angle that I couldn’t get it out, and before I could get back to a city to buy a pair of tweezers to try to remove the splinter, my hand heeled over the wound, and the tip of the acacia thorn settled into its permanent state: a small, gray mark on the palm of my hand. I always think about it like this: I carry Africa with me. It’s often just a story or conversation starter when I’m with friends and we’re comparing scars — “you see that spot on my hand? well this one time when I was super clumsy in Tanzania…” — but I admit there’s a tiny, strange, sentimental value to it. During the times when I’m homesick for the savanna, I think about how I hold a bit of it to keep me grounded when I'm thousands of miles away. A small mark that I can run my finger over to remind myself that I’m never that far from home. I can always go. And when I leave, it's a reminder that I will always find a way to come back. I always do. It’s been almost two months since I began my journey around the world, and as my last day in Africa comes to an end, I would be lying if I said I was ready to leave. In fact, for the past few days, I almost desperately wished I wasn’t. From the glaciers of Peru, to the markets of Morocco, to the green hills of Ethiopia, in the back of my mind I couldn’t help but feel like I was biding my time until I made it back to the golden, sun-soaked savannas of subsaharan Africa. So as the plane descended through the clouds and skimmed over the orange mountains of Namibia, I could feel an odd sensation of relief wash over me; the kind of relief you get after you arrive home and see a familiar face waiting for you at the arrivals terminal. I’ve spent a good amount of time in this region of Africa over the years, but still, the familiarity and comfort that these mountains and plains brings when I see them again is always profound. Since my first trip here, I wondered if over time its significance would fade, and if there would come a time when I’d visit and find that it’s not as hard to leave as it was when I first was here. And yet, I find the opposite happening. With each visit, the intensity of homesickness that hits me when I’m getting ready to leave becomes more poignant and significantly more difficult to deal with. The thought of the Johannesburg Departures terminal, of returning to paved roads and telephone poles after weeks of camping in the wilderness, of a room where I can’t hear the crickets and the elephants as I fall asleep at night, ties my stomach in knots. Coming home to the savannas gives me a sense of bliss that’s more brilliant and raw than anywhere I go or have ever been, but when the time comes to leave, I find myself as I am now, at a cafe in Zambia, drinking an espresso that doesn’t taste nearly as decadent as the instant-coffee brewed over a campfire that I’ve lived off of for the past few weeks, wondering why I’m leaving. It’s almost painful to think about how happy I am here, and yet I decided to buy a plane ticket to Asia that leaves in less than 24 hours, and something in me wishes that this time, I would have decided to just stay. It’s as simple and honest as that. This visit in particular has been difficult to put into words, as whatever I muster up always fails to properly convey how wonderful this experience has been. I’ll start with this, though: every day of my time here was extraordinary. We began in Namibia, making our way from the capital city to the desert of Namib-Naukluft, where we bribed our way into the park in the middle of the night to climb the world's tallest dunes at sunrise, and hiked to white salt pans and oceans of dry earth in an abyss of red sand, where ancient, crooked trees shaded herds of gemsbok. From Namibia we watched the desert turn into autumn forests then, slowly, to rolling plains decorated with villages and lazy zebra as we reached Botswana, making our way north until we ditched roads and towns for deep savanna, camping alone with prides of lions and the company of each other, not needing anything else. Finally we reached Zambia, where we were greeted by the thundering Victoria Falls, traversing the rim as we were doused by roaring water, loud enough that we could scream without anyone hearing, baboons watching from the canopies nearby. Every morning and evening was laced with joy and adrenaline; constantly enamored by every passing moment. Part of why I love guiding these expeditions is to see people who’ve never been to this corner of the world before see an elephant for the first time, or a giraffe, or a sunset from atop a dusty Land Rover, and to witness that kind of child-like captivation and glee as it unfolds across the faces of those around me. On our final night all together, as we sat under a flowering tree listening to the hum of Livingstone beyond the garden hedges, we began talking about everything we’re going to miss. Like those lovely, long mornings with amber light dousing the golden plains, sipping a cup of coffee with a rusk under the crooked shadows of acacia trees. The smell of the riverfront as you cross the veld; the smell of sage, sun-warmed earth, sweet grass. The sun dapples on the navy-blue ponds that sable antelope and zebra linger by, pinpricked by white cranes and hippos. Those sunsets, with spectacular ribbons of mauve, of burgundy, wrapping around the silhouettes of elephants bathing at the watering hole and a swollen, deeply red sun that just seems to beckon you to come closer. The electricity of the night air deep in the bush; of sitting by a simmering campfire in the evening, woodsmoke tangled in our hair and knotted into our sweaters; rooibos tea and deep, belly-aching, honest laughter ringing against the backdrop of crickets chirping and lions calling from just out of eyesight, only ten or twenty meters from where we sit in the center of darkness. The stomach-flipping adrenaline-coursing dip of a bush plane as it careens towards a herd of elephants grazing beside the delta at sunset. The way the acacia trees flicker with red as they reflect the campfire flames underneath a spectacular Milky Way. The singsong language of Tswana, and the nights sitting at camp playing music while we lost track of shooting stars. Waking up at 2 AM to lions pawing beside my tent, and yet feeling safer there than on some streets back in San Francisco. The fact that there was no road, no telephone pole, no bar of cell service for 100 miles; no possible way to be anywhere but there, in the heart of it, at the most honest and beautiful and true the world can be. I feel home there, in my bones, in the red dust on my shoulders and palms. It’s so hard to leave. Then, today. It feels strange to be sitting by myself right now, without people chatting and swapping stories and cracking each other up on either side of me, as its been for the past couple months. About three minutes ago, a British Airways flight took off from Livingstone to South Africa, carrying my final clients with it — people who’ve become good friends — and concluding my last photography expedition of the year. Already talk of 2017 is floating through the air and my email inbox — essentially asking the beautiful question of where I want to go, and even though nothing has been decided, already in the back of my mind I’m counting down the days until I land in Namibia again. But for this remainder of this round-the-world, I realize that from here on out it’s me on my own, as tomorrow I face Asia and wherever else and whomever else I’m on the trajectory to cross paths with. The unknown of that is part of what makes this kind of travel so rich, so rewarding, so endlessly inspiring, and why I will continue to revolve my life around the pursuit of discovery. Life should be felt, should be about color, about the world. For me, that involves the road, and that involves being brave enough to trust in the unknown of Indonesia, to give up Africa because I know I always find a way to come home, and I will. Maybe next year I'll spend a few months here; in the savanna with a tent, a Landy, some instant coffee, and good company. Right now, though, it's time to go, and to trust in the possibility of something else. Something more. This round-the-world has woken me up from the stiffness that a clockwork life drilled into me. It’s brought me an incredible amount of joy and opportunities and sincere, overwhelming happiness. But now, as a plane ticket looms tomorrow to carry me across the world to Indonesia, I can’t help but feel this daunting, unshakeable sensation that while one chapter in this RTW is closing — especially mixed with the hesitation and sadness of leaving this part of Africa — I know that there is something massive and important waiting for me in Asia, and beyond, wherever I end up. I don’t know what it is yet, but I’m ready to face it head on. I carry Africa with me, always, and will be home soon. When I think of my first visit to Morocco years ago, I remember spices. I remember gloriously orange, sun-burnt hills. I remember the morning when a stranger handed me a cup of warm mint tea as his way of saying “welcome”, and the wind was just cool enough to raise the hairs on my arms, and a sense of relief and calm washed over me. I remember the important bits. The romantic bits. The good bits. I know that memory distorts reality, it fades difficult moments, and most significantly, it embellishes. En yet, my memories of Morocco were rich and warm and deeply provocative, reminding me of a time when I felt like the world was at my finger tips, overcome with a sense of possibility and opportunity; where I constantly found inspiration around every cobblestone bend in an old market alleyway. Even when I was standing across from a woman at a dinner party about two months prior to the beginning of my current round-the-world trip, who told me about how difficult and dangerous and atrocious Morocco is — despite me telling her that I had already spent time there and was extremely fond of it — I couldn’t shake the wonder of why so many people I’d known, including this woman, had such obviously negative experiences in the same small nation in North Africa. When I personally thought of Morocco, I only conjured memories of honey, of figs, of the poetic flow of Arabic, of laying under the Milky Way with a soft layer of Sahara dust on my bare shoulders. But then I remembered everything I thought I had left in the past. And it took me standing in the central fish market of Tangier two weeks ago for me to suddenly remember. Morocco is not an easy place to travel. It is simply not an easy place to be. As a photojournalist, I think I’ve taken some of my best photographs in Morocco. Through the lens of a clouded memory where I only saw Morocco through the handful of snapshots I’d taken years ago, I’d forgotten about the exhausting bits, the difficult bits, of being a woman traveling in Morocco. When I decided to revisit the country on this round-the-world, I was naturally curious to see how my second time around would be different than the first. Morocco was always held to such a perfect standard in my mind. Which, I guess, is always an issue that’s faced when anyone revisits locations (comparison will kill you, so they say), and because I’d been warned so many times by various travelers before my revisit to be careful, I was ready, and a bit nervous, to see what would unfold. How Morocco would present itself this time when I was the leader, I was the guardian, I was the one to show an experience to a group of first-time-to-Africa travelers that would, hopefully, inspire them like Morocco had inspired me. The challenges didn’t diminish. If anything, over the course of my time there, more distinct hardships presented themselves. The repetitive food, extraordinary heat, and local aggression were the worst offenders, and I watched as people struggled to understand this country, this place they’d decided to visit, which turned out to be harsh and hot and poignantly hard. And I understood what they were going through. With the weight of everything that makes Morocco challenging on your shoulders, sometimes you look at those gloriously orange sun-burnt hills you’d been so excited to finally see in person and you realize with a sort of sober melancholy that maybe they are just brown. Someone asked me the other day what advice I would give to someone looking to travel to Morocco, and after thinking about this for awhile, I’ve thought of two. 1. Leave your preconceptions, projections, and biases at home. With its colorful tiled mosques glinting in evening light, massive ornate doorways, vibrant tapestries on turquoise streets, decadent-looking towers of freshly baked breads, it’s clear why photographers have poured over Morocco for decades, and why so many seek out an opportunity to photograph it themselves. (Insert me raising my hand here). En yet — and I think this is more true in Morocco than anywhere else I’ve ever been — for every profound image you may see of Morocco on social media or in a National Geographic magazine, you don’t see the thousands of missed-moments and almost-had-it’s where the photographer is chased away from a market scene by a lady wielding a stick, or the photographer returning to her room to stay inside for the rest of the day because of the exhaustion of being consistently objectified by men on the sidewalks. Morocco doesn’t hand out gifts if you don’t work for them. It does not offer you an easy pass simply because you’re a young, eager photographer. And most importantly, Morocco does not owe us anything. I’ve found that when someone does capture a great image in Morocco, it’s usually one that’s filled with emotion, light, color, a fleeting moment that’s then gone. And then it may be another week, or two, or thirty, until another brilliant image unfolds before them again. In Morocco, these fantastical moments don’t pour into our peripheral as easily as most other places in the world, because we have to work for it, and we have to respect Morocco enough to appreciate the challenge and the push to constantly fight to succeed. To keep trying. To keep seeking, to shake off the dust of missed moments and discouragement and doubt, no matter what. This even applies if one isn’t a photographer and is simply traveling through. By constantly pushing against Morocco — complaining about the food, the heat, the traffic laws, the smells — Morocco pushes back, and before you know it, you’ve left the country with a massive barrier built between you and the nation. For every moment you want to fight Morocco for being Morocco, the barrier grows bigger, creating such an obvious tension and disdain for the country that you end each day feeling frustrated, closed off, and leaving wondering what possibly went wrong. Morocco wasn’t supposed to be like this; it wasn't supposed to be this hard. But Morocco can be whatever it damn well pleases. When we are guests in someone else’s home, we must adhere to their ways, we must accept and recognize our privilege when facing situations that we may personally find abhorrently difficult. I’m not saying you have to leave Morocco feeling like it’s your favorite country. I’m not even saying you have to like it. But you must accept it, you must recognize your preconceptions and ideals that are preventing you from truly seeing the beautiful underbelly of Morocco, and you must know that you can wish and wish and wish that Morocco turns into the Morocco you’d always dreamed of, but if you don’t first acknowledge that Morocco may not be what you thought it was, you’ll never allow yourself the have the capacity to recognize that it’s just something different, not bad. Or, as I've found, something great. 2. Be receptive, and never stop seeking the good. When you travel in a country that seems to hand you challenges again and again and again, especially when you think you can’t possibly hold any more, it’s easy to find the temporary bandaid solution: put up your blinders, keep your eyes down, blame the country and its people for ruining what should have been an easy vacation. I understand this; I’ve struggled with it myself in the corners of the world I’ve felt most unwelcome. It’s easy to point fingers at strangers and to blame your surroundings rather than recognize that you are the foreigner in a far-off place where life is different, and beliefs are different, and you are not entitled to think that you deserve any kind of special treatment or painless travel just because you actively chose, and spent the money, to be there. Being a visitor doesn’t mean we have a right to decide how a country is or should be. It is what it is. We must seek and appreciate that. And finally, with blinders up, it’s impossible to see the good, and Morocco has so much good. For every challenge Morocco presents, something beautiful presents itself as well. For every angry stare or taunt in an overcrowded market, there’s someone shaking your hand with a genuine gusto, welcoming you deeply and sincerely to their country; who will teach you the constellations and tell you stories of their grandfather trekking through the Sahara over a cup of homemade mint tea. For every meal that tastes like countless others, there are just as many wonderfully decadent dishes; tastes of caramelized onions in a French-Moroccan stew, of complex spices toasting over a fire, of orange juice squeezed minutes before. For every dusty bus ride and broken AC, there are clear nights that are cool and quiet, paired with the perfect relief of a warm shower and clean clothes and the breeze of a rooftop restaurant in Chefchauen or under the stars of the Sahara; watching the setting sun glimmer on the tiles of mosques, the cacophony of the Call to Prayer echoing around you. I’ve seen, countless times, people grow jaded by the hard bits, which blinds them to the beautiful bits. It’s hard to actively seek these moments and to recognize their kindness and softness when it feels like rest of the country has made you hard. But for someone willing to travel to Morocco, they must be aware that there are treasures to be discovered if they’re willing and ready to find them. They are there. I promise, they are there. Travel to Morocco, but take an open heart with you. If you do, then you will sit on a rooftop with a cup of tea in hand, and you will watch those brown hills quietly fade into that glorious sun-burnt orange. The one you were looking for. It’s a Friday afternoon and I’m sitting at a cafe overlooking the main historic square of Cusco, Peru. It feels remarkably quiet compared to the past few weeks, as all the clients I’d been guiding across the Andes, the Sacred Valley, the Amazon, have all gone back to the United States this morning. This leaves me here, with a strong espresso and a bar of cacao I picked up on my way out of the Amazon this morning, nestling into the warm sun and welcome quiet like an exhausted trekker nestles into their sleeping bag at the end of an especially exerting day. I’m comfortable and aching with a special kind of tired, there’s a slight breeze rolling down the golden hills beyond Cusco’s cathedral, so now’s as good a time as any to write. And so, last year when I was offered to lead a photography expedition in Peru — with the freedom to build my own itinerary based on what I think must be done in Peru in two weeks’ time — I took the chance, curious how it would unfold. So I did, and Peru opened up in front of us. From the moment my clients arrived to the moment that I type this, Peru presented its beauty in a way I’d never seen it before. We followed the music and parades across the cobblestone squares of Cusco, photographing the festivals and markets with their rich colors of reds tapestries, vibrant fruits, smoky golden lights. We saw Machu Picchu, and were actually the first of thousands of people to see the ancient kingdom emerge as the clouds cleared at sunrise, and to be honest, it was indescribably more spectacular than what I had remembered (maybe it was the deep navy blues and the streams of light beaming on the tumbling ruins, or maybe it was just the people I was with). We rode trains alongside rivers swollen with rapids, we ate warm chocolate in the shadows of cathedrals, we rode horseback to high vistas overlooking deep, terraced valleys. We traveled across the nation to the Amazon, where we swung on hammocks beneath tangled canopies, fell asleep to the sounds of rain on thatched roofs and monkeys screeching from just outside our bungalow windows, ate fresh fruit picked from the trees in the backyard after learning about medicinal plants from an Amazonian shaman, or watching caymans and birds in the river as the sun — swollen and deeply red — sunk below the horizon. En yet, the most powerful and most significant moment of my time in Peru — and perhaps of all the time I've ever spent in South America — unfolded in a small village at about 15,000 ft, nestled at the base of the Ausangate Mountain in the high Andes. We drove, then trekked, for hours to this remote corner of the mountains, placed thousands of feet above the tree line where the oxygen was so thin that it was impossible to walk a few meters at an incline without a severe burning sensation emerging underneath your ribs. We were welcomed into the home of a local family who fed us soups heavy with potatoes and quinoa, plates upon plates of rice and cups of steaming hot mate de coca in their dining room, thick with the smell of woodsmoke and blustery mountain air blowing in through the cracked windows. As evening settled, we watched the grandiosely massive peaks have their glaciers illuminate in mauve sunset light, then eventually braved the sub-zero temperatures to dive into hot springs of natural thermal waters, steaming and bubbling and enveloping us in glorious warmth as the rest of the world froze and the sky above us shifted into an impossibly clear display of the Milky Way. In the springs that night, alone with those people, under those stars in the Andes, is a moment I know in my heart of hearts that I will never lose or forget for as long as I live. Two weeks from Monday, I leave for a four month round-the-world trip, and in the middle of panicking about finishing up 100 work projects while simultaneously preparing for my departure, you know what happens? Well, let's just say an emergency surgery and lots of bed rest happens. Naturally. However, on the plus side, all this down-time has given me lots of time for self reflection; such as, wow, I haven't posted on my blog in awhile. And so, in my half-delirium this morning, I decided to finally put together a post that a lot of you have asked for: San Francisco. After living here for 2.5 years and the finish line sorta-kinda appearing in sight, I figure now's as good a time as any to talk about my personal favorite highlights and must do's/eat's/stay's/hikes in San Francisco. Consider it an homage to this gem in Northern California. Consider it a comprehensive list of places you're most likely to find me on any given afternoon. Ferry Building farmers’ market (saturdays, 8 am - 2 pm): get the best donuts of your life at Pepple’s Donut stand, sample hundreds of different baked goods and hummuses and fresh jams, not to mention tons of food stalls both inside the ferry building & all around outside. Go hungry and ignore your bank account. The Slanted Door: top-notch Vietnamese food right on the water with spectacular bay views, with a very upscale vibe that feels like it belongs more in New York or London. The Plant Cafe: lots of locations throughout the city but the best is on the Embarcadero. Sit outside on a warm weekend morning for brunch. Hakkasan: upscale cantonese spot in the financial district (I’ve been to their London location, it’s top notch). Louis’ Restaurant: an SF institution that’s 100% more sentimental to me than it is good; it’s your typical diner fare but has sweeping 360 degree views of the ocean and Sutro Baths (so stop here for lunch or breakfast if you’re in the area). Really nice on chilly, gray days when you’re in the mood to look pensively over the ocean with a cup of coffee. Shizen: hands down the BEST sushi I’ve ever had in my life. absolutely phenomenal, and I don’t say that lightly. indulge here then stroll to Cream across the street for a mint chocolate chip ice cream sandwich between two fudgy warm cookies for dessert. Cafe St Jorge: definitely not the most accessible place if you’re not in the neighborhood, but absolutely worth the time to get there. dozens of the best cookies/muffins/cakes/breads you’ll have in the city, and the coffee is wonderful, the atmosphere is beautiful and lovely, and the entire place is unpretentious which is super refreshing in SF. A good homework/writing/reading spot to buckle down in for a few hours. Blue Bottle: because you’re in SF, and people will literally get mad at you if you don’t try Blue Bottle coffee. Samovar: okay, this is a tea lounge, but is so wonderful & chill & and the tea selections are out of this world. awesome for a rainy afternoon; they have snacks and small plates, too. Black Point Cafe: charming spot next to Ghirardelli square, so a good spot to pause and recharge when you’re on your tourist route near fishermans’ wharf. their lavender latte is especially delicious. Press Club: extremely attractive & classy wine bar downtown, absolutely perfect for when you’re in the mood to get a bit dressed up and be transported to midtown Manhattan or central London. Lengthy and interesting wine selections with a knowledgable staff, and prices aren’t outrageous considering the dress and location. The Barrel Room: also downtown, much smaller wine bar with just as many great wines; great for if Press Club has an insane wait. Good for when you just want to hunker down with a book or have a conversation where, you know, you can hear the other person. Wayfare Tavern: fabulous cocktails, exposed log beams, and a roaring fireplace; feels like you’re in a cozy, classy, antique lounge in Edinburgh. Beach Chalet: a hidden gem for sure, only really known to surfers and locals who live in the neighborhood. It’s a restaurant right across the ocean and on the corner of Golden Gate Park; have a house-made brew in the back garden/patio then dinner upstairs overlooking the Pacific, then walk across the street to the beach to catch the sunset. Don’t forget to check out the tulip gardens and old windmill! Biergarten: for warm lazy weekday evenings (you’ll never find a seat on a weekend evening, be forewarned); totally outdoors and German-styled, where you sit elbow-to-elbow with your neighbors at picnic tables under hanging lights. Techo de Lolinda: one of the few rooftop bars in SF, with fireplaces and heat lamps and strung up lights. Expect long waits on weekends but worth it on a warm evening. Museums: the deYoung is a must, Legion of Honor will take your breath away, and now the SFMoMa! Golden Gate Park: stroll through the botanical gardens, the conservancy of the flowers, the Academy of the Sciences, the Japanese tea garden, walk through wildflower-lined paths surrounded by redwoods and eucalyptus groves that lead to quiet meadows and ponds, and rent a boat to paddle around Stow Lake on a warm afternoon. Oh, and don’t miss the 3-day-long free concert Hardly Strictly Bluegrass if you’re here in October. Presidio, Palace of Fine Arts, and Baker Beach: The Presidio is great day hike to explore all the winding paths and parks that lead to hidden vistas of the sweeping skyline; end with a late afternoon gaze up at the high Roman domes and statues at the Palace of Fine Arts, and catch the sunset against the Golden Gate at Baker Beach. North Beach and China Town: for the finest Italian food, espressos, and City Lights Bookstore, then remarkably cheap and divine dumplings under the hanging street lamps of eclectic China Town. Lands End: a park literally at the edge of the world. quiet and stunning and hovering in the trees above Sutro Baths. You can also fairly easily reach the Legion of Honor from here too, so consider doing this all in one loop. Explore the oddities and curio shops in the Mission and Hayes valley (a little too hipster for me – actually uncomfortably hipster – but a must-do if you’re in town). The thrift stores, street art, vegan eateries, and artisan chocolate shops feels a little like a mini-Williamsburg, Brooklyn. This area also comes alive at night with its rooftop bars (such as Techo de Lolinda) and iconic Dolores Park which sometimes shows outdoor movies. Have a bonfire on Ocean Beach, and do your best to spot dolphins and whales from where you lay in the sand. Marin County and Redwood Forest: if you have the ability to rent a car (or are willing to brave the tourist buses that pick up/drop off in downtown SF so you don’t have to worry about parking), go to the Muir Woods to see one of the most gloriously beautiful redwood forests on the planet (just go super early!). Then pause at Muir Beach to dip your toes in the water, and if you want, keep on driving along Highway 1 to Stinson Beach and/or Bolinas for dinner and epic SF views (charming little surf beach towns that feel like they’re a million miles away). If you want to make this a weekend trip, spend a couple nights camping and backpacking at nearby Point Reyes. Tiburon & Angel Island: take the ferry from either Tiburon or San Francisco to Angel Island to hike to the summit of the island (around 2-3 hours) for absolutely stunning views of the ENTIRE bay area; you’ll hike through fields of wildflowers, eucalyptus groves, and be treated with remarkably few other people as lots of folks don’t realize this is even a thing. Pacifica, Pescadero, Half Moon Bay: Easily a day trip (or even half-day trip) if you have a rental car, these three towns are adorable beyond words. Pacifica is a mere 10 minute drive down the coast, then Half Moon Bay is about 10-15 minutes from there, then Pescadero is just another thirty minutes south. You’ll pass quaint lighthouses surrounded by fields of wildflowers and berries, rolling mountains tangled in vineyards and forests and farm pastures, steep, jagged cliffs cascading into the ocean. Go antique shopping in the sleepy towns, and if you’re around in the summer, go berry picking at Swanton Berry Farm near Pescadero, and have a picnic lunch on a hike or at the Half Moon Bay Brewery, with sweeping views of the ocean and hills. Just be back in Pacifica in time for dinner at Moonraker, where the floor-to-ceiling windows fall sheerly into the ocean, the farm-to-table food captivates you, and the sunsets will take your breath away. Live your California-road-trip-down-the-coast dreams. Petaluma: Petaluma is a great day trip just for the sake of awesome antiquing in downtown Petaluma and getting the beer sampler at Lagunitas Brewery. A nice way to see the Napa-area without going to the overwhelming tourist hole that is Napa itself. Mendocino: a weekend trip for sure, but a lovely getaway drive up the PCH to a stunning oceanside town where I stayed at the best bed & breakfast of my life (Stanford Inn by the Sea). Kayak and bike your heart out. Lake Tahoe: okay, this one you have to get to with your own car or rental, but, it’s merely 2.5 hours away, and do not miss it if you can. Big Sur: a weekend getaway, roughly 3 hours, just bring your own tent if you don’t want to pay for expensive AirBnB’s and hostels. Yosemite: easily reachable by car (3 hours) or by tourist bus that’ll pick you up downtown. No excuse. You’ve gotta go. (If you’re camping though, make reservations ahead of time). San Francisco’s summer truly peaks in late September / early October; it’s when the temps are at their balmiest (which is still just a mere 70-80*F) and when the fog is most tame. But you really can’t go wrong; the wildflowers are at their peak bloom in March and April, and the mountains & hills at their greenest in February and March (which also tends to mean the most rain). The weather shifts dramatically though so there’s no real telling how the temps will be; just pick a month and know it was luck of the draw. or, stay with me. Or, AirBNB-it. This is the AirBNB capital, after all. Enjoy SF! Eat a lot, complain about housing prices, spend every evening catching a sunset, and you'll fit right in. At a seaside bar in Mykonos, there's the typical conversation. Travelers are two beers deep and are swapping stories about how long they've been in Greece, which leads to how long they've been in Europe, and then how long they've been on the road, period. It used to surprise me how there was always one person, without fail, who'd been traveling for well over two years, with no real intention or need to stop and return to "real life." It just didn't seem possible that someone could travel for that long — essentially indefinitely — and find ways to make enough money to keep going, and keep seeing the world. And here's the thing: these people rarely had extraordinary, dreamy, high-paying travel jobs. They weren't professional travel photographers or travel bloggers, paid to galavant the globe and show people at home what it's like to see the mountains of Tibet or the temples of Bangkok. They were just average people with typical skill-sets who wanted to travel, and who found ways to make it sustainable. So that's where this list comes in. I've compiled all the ways any average person can make money and sustainably travel for extended periods of time. You don't have to build a lucrative travel blog or be the next big Instagram travel documentarian. You just have to get ready to be creative, put in some elbow grease, and the world is yours. More often than not, hostels are absolutely willing to hire travelers to help out in exchange for free board, food, and pay. It's worth asking around at the hostels that are in an area you wouldn't mind hanging out in for awhile, and see who has the best offer. In some cases, hostels have been know to milk it and won't pay staff that's just traveling through, but even if it's not paid, it's a good opportunity to lay low for awhile, save money, and focus on other ways to earn cash. Earn your keep by picking fruits, vegetables, or flowers at farms that need a hand. You can do research locally once you arrive, or see what's available from the comfort of your laptop on www.PickingJobs.com or www.Workaway.info. Put up ads and fliers in coffee shops, markets, hostels, and online, and offer what you can: tutoring in your native language, or on a subject you're well versed in (such as in the maths or sciences, or in an art such as photography or singing). You can also look into finding a job as an English teacher (check out www.EslCafe.com). The situations and benefits vary greatly depending on the kind of commitment you want, but typically you'll receive room, board, and a weekly paycheck; not to mention it's a great way to get to know a culture. Look at listings on www.aupairworld.com. Whether you're a photographer, a painter, a writer, or a musician, utilize your skills to gain revenue. Sell your artwork in markets, in hostels (with permission), or open an online shop (such as Etsy or Society6). If you want to freelance, see what jobs are available in your area on Craigslist, and frequently peruse community boards to see what's in demand. If you're more interested in selling photography, submit photos to distributors such as ImageBrief or iStock, and get in touch with the tourism bureau of where you're traveling. If they're interested in your photos, it's a great way to make money. Different than what I said before about tutoring: this is more for those of you who want to be even more mobile, or would rather try something more low-key than revising calculus. If you think you're good enough at yoga or tai-chi or meditation, host classes as you go, charging a certain amount and hanging fliers in hostels and community boards. If your skills lie more in the department of sports - such as diving, surfing, or climbing - see what job opportunities are available at adventure companies in your location. It may be more difficult to find work without first applying for a work visa in your respective country, but it's worth considering. Elance is where companies - from big corporations to small businesses - post listings looking for freelance work, and from the thousands of job listings that are constantly being cycled through Elance, there's undoubtedly something that matches your skill set. Whether your background is in web design, writing, programming, illustration, marketing, consulting, legal work, or engineering, you will find something that can be done remotely while you're on the road. Check out www.elance.com. I'll back up to 2009. I was standing by the mailbox. There was an open envelope in my hand and a letter in the other, with the National Geographic stamp at its head, announcing that I'd been accepted onto an expedition to a country I'd only really known about through magazines and Animal Planet documentaries. I was young; I had never really traveled before. I recently had gone through the process of selling my horse and putting an end to my goal to be a professional equestrian in order to trust in the promise something else, something different, something out there. Around this time, I heard of an opportunity through a friend of a friend to travel as a photographer with National Geographic to an obscure nation in East Africa. This came at a time when I was deciding whether or not I wanted to give up my life as an equestrian — a path I'd been pursuing since I was a little girl — in exchange for a chance to go abroad. At the time, I'd already been working as a photographer for several years on the horse show circuit, so even if I knew my way around the back of a Nikon, I was a stranger to the idea of Africa, of leaving the safety of New York, of going out there. In the months leading up to my departure, I enveloped myself with the looming idea of Tanzania, overflowing with daydreams of sloping golden savannas pinpricked with acacia trees, lions purring outside my tent walls, tangled jungles falling way to the foothills of Kilimanjaro. These images saturated my mind as I poured over guidebooks, documentaries, and my stepfather's stories and photographs of his time backpacking through East Africa in the 70's. And when the day finally arrived, after 19 hours of flying across three continents, when I stepped off the plane into that heavy, thick African air on that humid night in July, I was surprised by something. I wasn't afraid. Instead, there was this quiet sense of belonging. Like something was tapping me on the shoulder, saying, Finally. You made it. It's taken me years to be able to put into words what I feel when I think of my experience in Tanzania, and still, I always feel as though I fall short; I've come to terms with the fact that I may never be able to properly say just what it really feels like to fall asleep with a mosquito net draping your bare arms and why it took me weeks to be able to fall asleep without that once I was back in New York, or just how right it feels to crawl into a tent at night, your skin heavy with dust and freckles and sunlight and remnants of sweet chai on your lips, sleepy and warm and listening to the owls and the hyenas as you zip into a sleeping bag. But I'll give it a go, because on this evening in 2016, it's worth a shot. I consider my time in Tanzania as the changing point, the turning point, of everything. The point when my life did a complete 180. It seemed like every aspect of that country became apart of me, filling my veins and my chest and every corner of my being; from the red soil etched into the palms of my hands, to the rich smell of woodsmoke and ginger chai, woven perpetually into my hair, my clothes, laying soft on my skin. The markets, vibrant and crowded and laced with the heavy scent of roasting chapati, towers of garlic and colorful peppers, and the singsong of Swahili echoing over the cooing of children and baboons stealing bananas and retreating to the canopies. The evenings spent sitting cross-legged and barefoot on the roof of our Land Rover, watching herds of hundreds — maybe thousands — of wildebeest and zebra migrating against the backdrop of an orange sky with a red sun so plump and heavy it looked like it'd burst at any moment. Moonlight cast on the backs of lions, soccer in that field just beyond the sunflowers, card games by the fireside. Beauty so brilliant it makes you drunk with heartache. And the one afternoon when we spent six hours climbing to the top of a mountain in the northern savanna, just to sit at the rocky summit and listen in silence as a herd of elephants trumped from somewhere indiscernible in the valley below, and I decided as I sat there that this was what I would dedicate the rest of my life to, that this was what I was being lead to my whole life, that this would be where I'd return to stay someday, and it was as simple as that, the end of one part of my life, the beginning of the rest. I still have never been so sure of something in all my life. I had recurring dreams about going back to Tanzania. However, in the dreams, I never made it back. I always got caught in darkness, only to find that my flashlight was broken, or the street lights were out, or I would get hopelessly lost, and I'd wake up before I'd reach those warm fields of sunflowers and stand in the shadows of Mount Kilimanjaro again. When I first left Tanzania in 2010, I wasn’t just nostalgic for the memories I’d made there. It was more than that. It was homesickness. It was extraordinary. It was overwhelming. It was everything. I was deeply devoted to that land, and it felt like my whole heart was waiting for me to come back to it. I was sure I’d never feel that kind of overwhelming sense of home again. And sixty countries traveled later, I have never, not even once, doubted that. In those years following as my momentum picked up as a travel photographer, I’d been to the African continent on almost 10 occasions, and each visit was measured — in my mind — by its distance to Tanzania. How close was I? How long would I have to sit on a bus, on a plane, on the side of the road with my thumb upturned, waiting for a ride, until I was back? Africa continues to be my favorite continent to explore, discover, and photograph, but nothing held anything to Tanzania. It felt like every step I took was considered, even if only slightly, to taking me back to the magic of that nation in East Africa. Then there came a point when I decided that it was time to go home, and to stand in those fields of sunflowers again, to feel the shadow of Kilimanjaro cast on my bare shoulders. The magic of East Africa was even more palpable, more magnificent, more soul-stirring than I remembered. In 2014, I spent two months backpacking through Tanzania, Kenya, Uganda, and Rwanda; which is a whole other story entirely, that I'll write about one of these days. The point of this post, I guess, is that we can travel to some beautiful, sentimental places; I know for sure that the adventures and experiences I've had while on the road have all left me with some kind of nostalgia that's spurred and particularly heavy every now and then. But I truly believe that there is one place that is home for each of us. Where we step off the plane and know, immediately, that we are being welcomed home. It feels familiar, and it's a sensation strong enough to bring us to our knees. We don't realize that we've been looking for these places, or that they even exist, or where they may be, until they find us. You'll be grateful for every decision you have ever made, because it brought you there. You'll thank yourself for the rest of your life for taking the chance to go. You will spend the rest of your life pointing every step you take, even if only slightly, in the direction of home. And you'll be welcomed, with fields of sunflowers. Every once in awhile, this beautiful thing happens. Ah, it's here. I finally found this place. What I'm trying to say is that for the first time in awhile, that happened today. I sat in the snow, I took off my gloves, I let my snowshoes splay behind me, I listened to the echoing stillness of the summit of a mountain in the Finnish Arctic; the very same mountain I'd ached to someday see since I was 12 years old and saw flitting images of it on the pages of National Geographic magazines. I think I've dreamed of this place long before I ever arrived. For awhile now, I've been in the Arctic. Specifically in Lapland, Finland; far north of the Arctic Circle. I'm the photography guide for an expedition team, which is a group of aspiring photographers and travelers that I've grown immensely close with as we've endured some of the harshest weather conditions I've ever personally experienced, as well as the travel misadventures that comes with exploring a place so unpredictable and ever-changing. When I arrived in Helsinki in early January to greet everyone, I knew immediately on that first night that there was something very different and very special about this group of people. (To sum it up: on our first night together, we sat around a water pitcher in a dim airport hotel and talked and laughed for three hours straight). I felt something was different. And each evening closed with tea and photo critiques under the warm lights and log beams of our cabin, a sauna in the backroom, and a 2-course meal made completely from scratch by Kylie, which we'd sit around the table and dine on, laughing and musing and asking question after question, as we waited for the magnificent Northern Lights to make their way into the enormous black sky... which never happened, despite long hours in the middle of night spent standing desperately in frigid open clearings of tundra with our necks craned upwards at empty, gray clouds. This is, however, until our final night in the Arctic; AKA, the night as I write this, curled up on a couch in our remote cabin on the edge of a dark lake, and a ribbon of mauve and emerald colors above. I was literally so overwhelmingly excited when our spotter said that they had appeared that I ran out of the cabin into the -30*F cold wearing just a light jacket and my yoga pants and untied boots but camera in tow. All the hours of practice and drill we went through to get our gear on as fast as possible flew out the window, and it couldn't have been more perfect. And the Northern Lights danced, just as I remembered they did. They shimmered, just as I remembered. They rippled, they exploded, they rained, they burst, they rose, the soared. Just as I remembered. And yes, we screamed. And we danced. And we hugged each other. I cried a whole, whole lot. And that's how it went here. Every day, with a new adventure, new reason for laughter. We snowshoed through frozen forests and across brilliant tundras, in places that felt more like another world than anywhere else on Earth. We lost count of the herds of wild reindeer we passed time and time again. We broke bread with locals, we said yes to every opportunity, we asked questions. We found ourselves immersed in moments so genuine and authentic that it was hard for me to believe that we were this lucky, lucky enough. We ice fished. We cuddled baby sled dogs. We ate more soups than I can even count, with names I can pronounce. My mouth was consistently dry from talking and lecturing and talking even more. And we succeeded. We came home each day, frozen and rosy-cheeked and flustered with excitement and that sweet exhaustion, smelling of campfire smoke and lingonberries. Let me note here that the trip isn't over yet; just our time in the Arctic is coming to a close. Tomorrow we go back to Helsinki to board a boat heading into the frigid, dark Baltic to take us to the shores of Estonia, but as this next journey hangs over my head, and the fire in the fireplace is burning out and the cabin is settling in for the long night, I can't stop thinking about these moments in Finland. All these bits and pieces, all the moments of absolute joy, seemed to all come together today as I sat in the snow with my gloves off, and my snowshoes splayed, and the epic silence around me. While finally seeing the Northern Lights tonight was a gift beyond anything I could ever put into words, it was this morning on that mountain that brought it all together; that moment when I felt an onrush of memories of myself years ago, looking at the photographs of this one particular frozen mountain in the high Arctic of Finland. This place, those images, that seemed to stay in the back of my mind and had been, perhaps, driving me, even if only slightly, to where I sat today. On that very mountain. The one I'd been working towards. The one I'd spent years waiting to discover. The one I walked onto and recognized from my dreams. more photos in the days to come.